Blazer Football is headed to Carrollton to take on West Georgia. VSU versus West Georgia is one of the hottest rivalries in the Gulf South Conference. 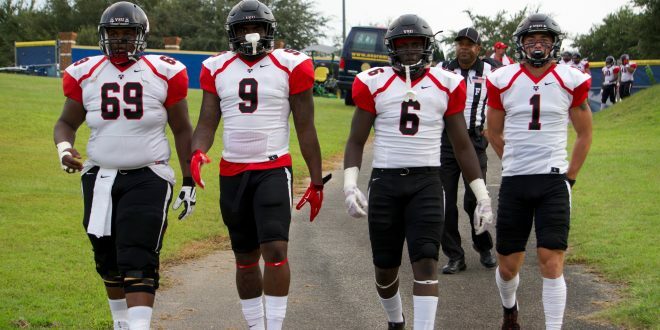 Coming off their first win of the season against the University of West Florida, Blazer football is hitting the road again hoping to defend the peach basket. VSU won 30-19 to give West Florida their first loss of the season. The Black Swarm did what they’ve been doing all season by putting the Blazers in the position to win games. Their defensive output was complemented with a consistent game from the offensive side, resulting in a win for the Blazers. Quarterback Adam Robles had a good performance while filling in for Rogan Wells. Robles threw for 21-38 completions and a touchdown to Dallas Baldner. The Blazers now will have to face one of their oldest rivals in the Gulf South Conference: West Georgia. In their upcoming game they’ll be facing a man far too familiar with the Blazer’s Football program. West Georgia’s head coach David Dean, will be facing VSU for the first time since his departure from the program two seasons ago. Dean is the most accomplished coach in Blazer history. He spent 16 years in the program. The first seven he was an offensive coordinator and spent the final nine as head coach. Dean had a hand in all three of VSU’s national championships. Dean is the winningest coach in Blazer Football’s history with a 79-27 record. Dean is no newcomer to Carrollton, however. He spent eight years as an assistant coach at West Georgia prior to joining VSU’s staff. This game will mark the first time since 1999 that Dean has faced the Blazers. As if those stakes aren’t high enough, the Blazers will be competing to keep the peach basket. The basket is a traditional trophy that VSU and UWG have competed for over the years. VSU is the reigning basket winners after beating the Wolves 38-27 last season. The Blazers are coming off a bye week and will face against a hot West Georgia team. The Wolves are coming off consecutive wins to teams the Blazers have lost to earlier this season. The Wolves, are in a three way tie for fourth in the No. 25 in the NCAA Division II rankings and are versatile team with their well-balanced offense that ranks second in GSC for passing and rushing. Facing against two running backs in the GSC top-ten for rushing, a quarterback that’s first in passing touchdowns and a stingy defense may be the Blazers toughest challenge yet. However, the Blazers are well equipped to take on a team like West Georgia. The outcome of the game will weigh heavily on the Blazers defensive effectiveness. The Black Swarm will look to hinder any momentum from the Wolves run and pass game with linebacker Malik Slater, who averages 9 tackles a game, and defensive tackle Guito Ervilus, who has 4 sacks in just three games. The Blazers will likely see the return of Rogan Wells this weekend, according to coach Bell. The freshman was held out of the contest against West Florida due to an injury to his non-throwing shoulder. The game will be hosted on Saturday, Oct. 7 in Carrollton, Georgia. Kickoff will be at 2 p.m. Written by Josh Miller, Staff Writer. Photo by Seth Willard, Photo Editor. Next What’s Your Take: Superteams too superior?